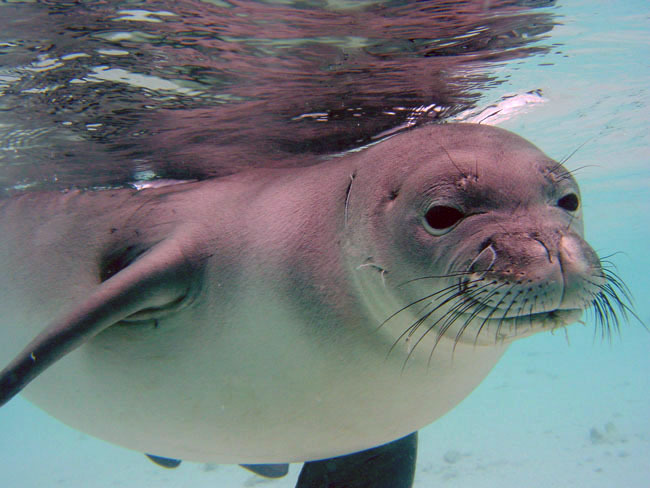 Hawaiian Monk Seal is an endangered seal, native to the Hawaiian Islands and it is believed to have evolved there. The Hawaiian Monk Seal is the most endangered seal in U.S. waters, with a population of about 1200 (the most endangered seal in the world is the Mediterranean Monk Seal). The Monk Seal subclass is the only type of seals that prefer tropic regions rather than polar climates. These seals have gray to brown fur and can grow up to 2.4 metres (8 feet) long, weighing a massive 400 to 600 pounds (180 to 270 kg), females generally being larger and heavier than males. Being the oldest members of the Pinniped order, their appearance hasn’t changed for 15 million years. The reason why the Hawaiian Monk Seal got it’s name is a subject to discussion – some think it’s because of the loose skin around it’s neck, resembling a monk’s hood, others think it’s because of their solitary lifestyle. The Hawaiian Monk Seal usually lives alone, feeding on fishes, octopuses, eels and other sea creatures, sometimes even birds or other seals. They prefer rather shallow waters, where sharks can’t access them. They can, however dive as deep as 600 feet and stay underwater for more than twenty minutes. Their breeding usually takes place in spring and summer months and after a gestation period of about 360 days the mothers find sandy beaches to give birth. For six months, the mother doesn’t leave the pup, not even to feed – during this time the mother lives on the fat, stored up in her body and feeds the pup with fat rich milk. The seals become sexually mature at the age of six and can live for as long as 20 years. Sharks, most notably the Tiger Sharks are natural predators of the Hawaiian Monk Seal, however the reason for the decline of their population is human encroachment. Many seals get trapped in fishing nets or suffer from trash in the sea. Also, humans coming near to a newborn would most likely cause the mother to abandon the pup, almost always resulting in it’s death, therefore it’s crucial for people not to get involved in the seals’ lives. It is illegal to come closer than 100 yards to a Hawaiian Seal pup, although more and more of their natural habitat being inhabited by humans. The Hawaiian Seal Monk is classified as “Critically Endangered” by the IUCN and the population of these seals is declining, as a result of human actions. It is illegal to hunt, catch or harm these seals, however their vulnerability to change in their natural surroundings is still causing a decline in the population. Also, studies show that the number of Hawaiian Monk Seal males outnumber the females greatly, causing a slow natural reproduction. 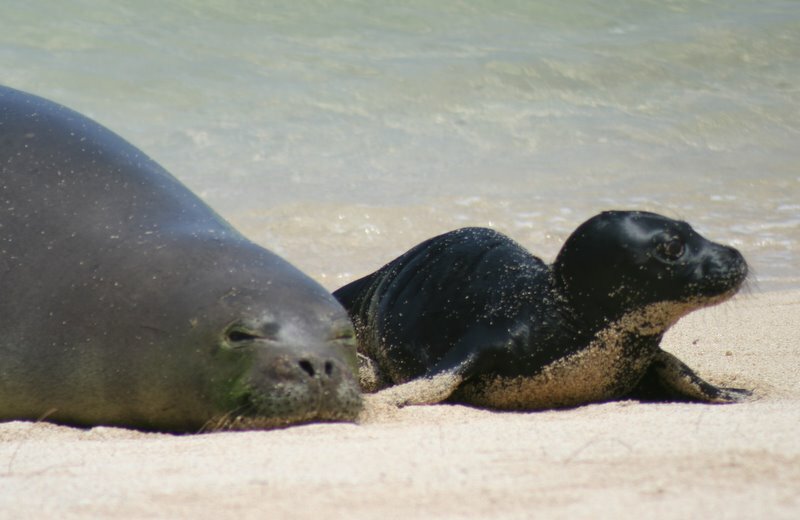 As of now, the fate of these one of the last two species of tropical seals is uncertain, although actions are being taken to make their population stable again, as a new Hawaiian Monk Seal recovery plan was introduced in 2007.